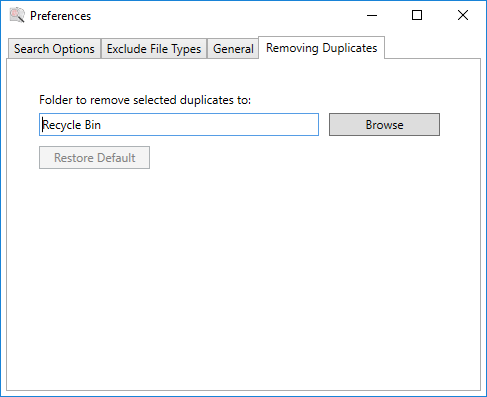 By default, Duplicate Sweeper uses pre-defined commonly used criteria for searching for duplicates. 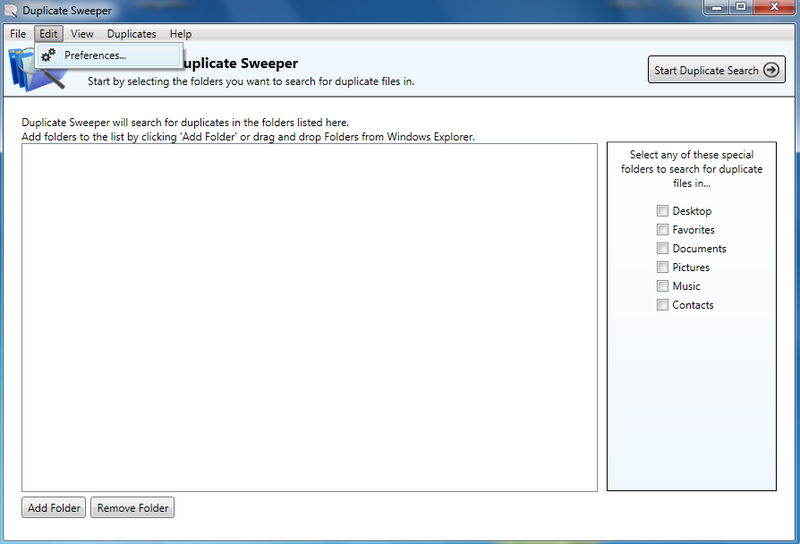 If you are an advanced user, you may wish to setup Duplicate Sweeper preferences yourself as described in this section. Should you wish to access the Preferences Menu, click on "Edit" on the menu tab, and proceed to click on "Preferences...", as shown below. This will open the preferences menu. This is the default window for the preferences menu, and it's under the tab "Search Options". It allows you to define an upper and lower limits for the search. Any files with a size that does not fall under the criteria defined is not scanned. By fine-tuning this preference, you can achieve even faster duplicate search. This option is under the tab "Exclude File Types". In this tab, the user can define specific file types, which will be ignored when performing the duplicate scan. The program will use a default set of common system file types, but more can be added or removed at the user's discretion. Under the General Tab you have an option to stop Duplicate Sweeper showing you the tutorial video after a duplicate search. Here you can choose a location on your computer to move your selected duplciate files to. By default, this is set to the "Recycle Bin" on Windows PC or "Trash Can" on Mac.